Premiums for GSA Morgan Dollars? 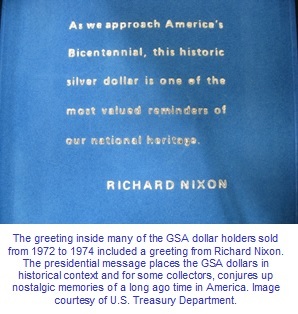 In 1970, Congress authorized the General Services Administration (henceforth called the GSA) to sell to the public nearly three million Morgan Silver Dollars held in Treasury Department vaults. The GSA is an agency of the federal government that oversees the purchase, supply, operation, and maintenance of federal property, buildings, and equipment. The GSA is also responsible for the sale of surplus matter. 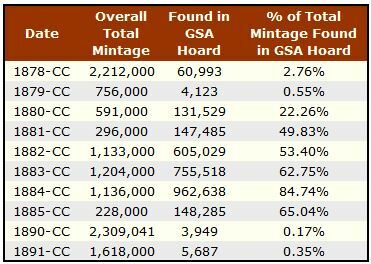 Thus, over 95% of the GSA hoard was from the Carson City Mint, and nearly all of them were deemed to be Uncirculated. That so many of them were like new surprised no one, since many hundreds of the silver dollar mint bags -- containing 1000 coins each -- were never opened. 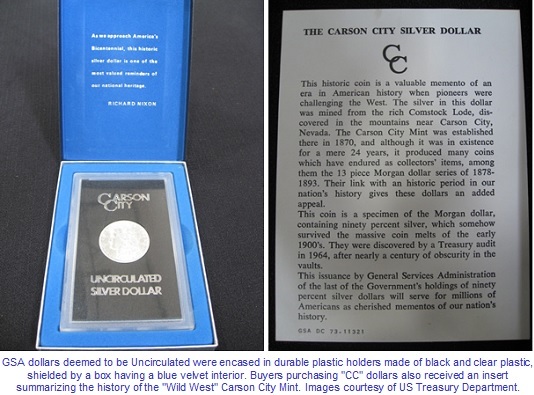 Of the total Carson City output of Morgan Silver Dollars, 72.5% of them were preserved in this remarkable stockpile. Distinctive, clear and black hardened plastic holders were manufactured to house coins placed in the Uncirculated categories. Dollars that we judged to be circulated (a much smaller quantity) were distributed in thin, "soft pack" flexible plastic sleeves, shielded by blue envelopes. The GSA planned a series of mail bid auctions. Minimum bid prices for each date were set, with limits placed on the number of dollars any bidder could purchase. The first sale began on October 31, 1972. Three dates were available for purchase: 1882-CC, 1883-CC, and 1884-CC. The minimum bid was $30.00. The first GSA sale resulted in a liquidation of 700,000 coins. Additional sales were held in 1973 and 1974. At the conclusion of the sale ending on June 30, 1974, there remained one million unsold silver dollars in government vaults. GSA officials were disappointed with the perceived lack of interest from the public. Imagine the frenzied Internet bidding if such a program were held today! Another round of GSA sales were held in 1980. At that time, silver bullion prices were rapidly rising. In this environment, the leftover dollars sold quickly, with the final sale drawing to a close in July, 1980. At that time, what we view today as the legendary GSA Morgan Dollar program, entered the history books forever. Overall, the sales grossed $100 million dollars. The net proceeds were deposited into the U.S. Treasury. At the time, many owners considered the GSA holders as a nuisance. Almost immediately, coins were cracked out of their government issued holders for easier transportation/storage, and later, for third party grading purposes. Recall that the vast majority of GSA dollars were deemed to be Uncirculated. In the early 1970's, grading had not evolved to the level of specificity we use today. What we might call MS-60's were lumped together with MS-67 examples. Most buyers had no control over what they received. As the years wore on and MS quality increasingly influenced pricing, it was clear some original GSA dollar buyers were luckier than others, in that they randomly received coins that today reside at the upper end of the grading scale. 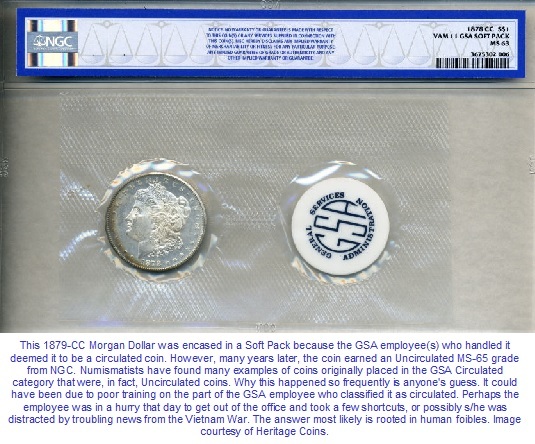 In 2004, one of the leading coin grading companies, Numismatic Guaranty Corporation (better known as NGC), began grading GSA dollars in their original holders. 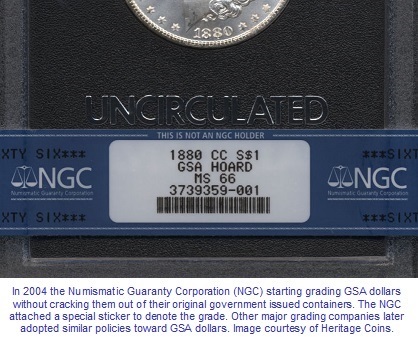 The NGC grade was designated by a sticker affixed to the GSA holder. This move also had the benefit of accumulating population data, i.e. how many of each GSA dollar dates were being graded, giving us some data for assessing survivorship and scarcity. As the GSA dollars continued to establish an identity of their own, many collectors were willing to pay more for a coin in an original GSA holder. For example, an 1890-CC in a GSA holder could sell for more than the same coin in another holder. Taking note of this, beginning in around 2006-07, several major coin publications started providing separate lines for GSA dollars in their price guides. In lower Mint State grades, the GSA premiums are small for the Carson City Dollars dating from the 1880's, the most common dates of the hoard. This smallness disappears as you progress upward along the MS scale. 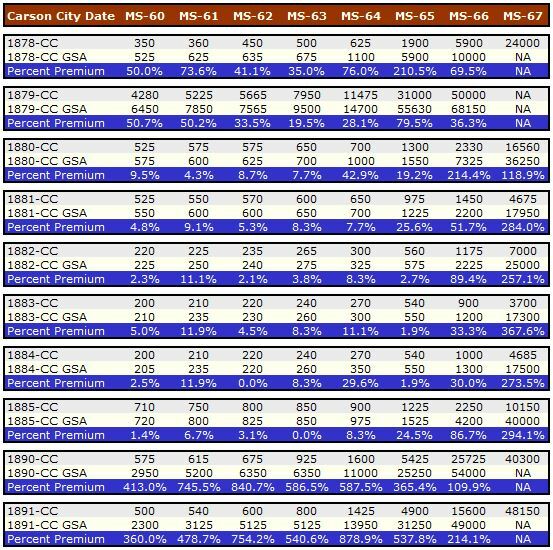 For example, for the 1884-CC in MS-60, the GSA premium is barely a trickle, at 2.5%. However, in MS-67, the added value for an example in an original GSA holder skyrockets to 228%! For "CC" mintmarked coins from the 1870's and 1890's, the GSA premiums are staggering, across the entire MS spectrum. Some GSA dates are selling for multiples of their non-GSA equivalents. For example, in September 2014, an 1879-CC Morgan Dollar in its original black plastic holder sold for $42,770.90. The ballpark price for the same date in similar quality not housed in a GSA holder is closer to $30,000. [Side note: The GSA dispersed most of their 1879-CC dollars in February 1974 for an average winning bid of $478.39]. GSA Dollars sellers tend to get higher prices if they have the original shipment materials intact, including the numbered certificate. As is always the case in collectibles, the better the condition, the greater the value. Now that we've established GSA premiums are real, let's now focus on why the premiums exist. As is nearly always the case in collectible values, the law of Supply & Demand comes into play. First, let's discuss the supply. As we have already mentioned, GSA plastic was not well-liked by dealers or collectors for decades and were discarded with great regularity. No one has an exact number, but it seems certain GSA holder survivorship is relatively small compared to the original quantity issued. Thus, not only are there not many GSA dollar holders surviving, their number is a very undersized subset of the total universe of Morgan Dollars. Absolutely, the supply of GSA dollars is quite limited. Next, consider the demand. 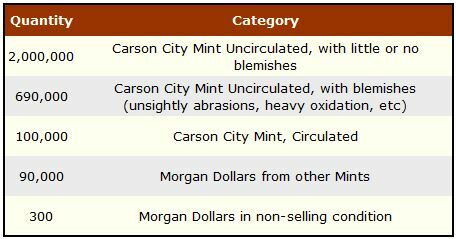 Morgan Dollars are popular collectibles to begin with, but now factor in additional layers of desirability: GSA holders are genuinely scarce, and the vast majority of them house coins from the esteemed (especially in the eyes of collectors) Carson City Mint. Buyers are willing to pay a premium if they are convinced the extra investment will sustain its value and possibly increase over time, thus driving demand. GSA premiums have been around for a long time now, so there is little risk to buyers of being caught up in a passing craze. Personally, I think there may be another element boosting the status of GSA dollars. My observations here are totally unscientific, just a gut feel on my part. I was born in 1959, which puts me on the tail end of the Baby Boom generation. Boomers today make up a significant portion of the U.S. coin collector base. Speaking for myself, GSA dollars evoke emotion, summoning up memories of my youth and of a nation society long gone. I believe I am far from alone in my feelings. For me, GSA dollars are a visible connection to the past. reminding me of a simpler, carefree time in life. During the few short years when the GSA Dollar program was active, personal computers, email, smart phones, and political correctness were things no one had ever heard of. Heck, if I had to, I could still operate a rotary phone, Polaroid camera, or a slide rule. Can you Gen X'ers and Millennials dig it? By the millions, Americans flocked to movie theaters to watch "The Sting" or "Paper Moon". I was there too. Rarely did I miss an episode of "The Brady Bunch" or "Sanford and Son". Even today, when I reminisce on Fred G. Sanford, a warm feeling overcomes me and I may burst out in laughter, or shed a tiny tear or two. The lyrics "Don't Rock the Boat, Baby" helped break the boredom of a teenager mowing his grandparents' lawn on a hot summer day. Back then, my favorite baseball team, the "Big Red Machine" was a perennial contender to reach the World Series. Johnny Bench, Pete Rose, and those guys, they were really BAD. (translation: back then, BAD, when used in this way, actually meant GOOD) Ahh, those were the days. There's more. If you look on the inside of a GSA box, you'll see a greeting from Richard Nixon. Just hearing the former president's name unleashes a torrent of memories. Remember when all three TV channels carried the Watergate hearings live? At times, the non-stop coverage was frustrating because there was nothing else to watch on TV. Now I remember the headlines nostalgically, though at the same time I wonder where have all the presidential investigative reporters gone today? 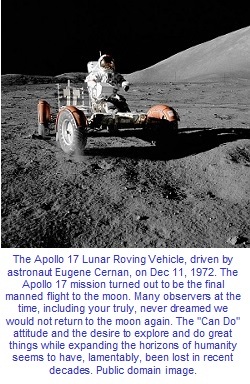 The final Apollo lunar mission. The end of the Vietnam War. The jubilant return of American POW's. The Saturday Night Massacre. The OPEC oil embargo. Streaking. Vice-President Gerald Ford. The Resignation. All are wistful remembrances occurring in parallel with the GSA program. By now, some of you groovy cats are probably wanting me to close the shades; this old toad is just too far out. I should just buzz off and split the scene, since I am really out to lunch on this one (sorry, more 1970's lingo). Everyone knows sentimentality has nothing to do with what's going down with the GSA dollars, correct? In reality, those of you who hold that belief are most likely right on: the presence of GSA premiums are based on fundamental economic principles, not emotion. That's good news for collectors. Yet at the same time, I don't think I'm completely full of jive, either. I would like to hear what others have to say on this topic.